Lenco L-85 review | What Hi-Fi? Remember the DUPLO blocks you’d play with as child before graduating onto proper LEGO sets? Think of the Lenco L-85 as that: a beginner’s turntable that gives you all the basics with promise of more exciting things, while still being enjoyable in its own right. This is a semi-automatic, belt-driven turntable with a built-in phono stage. It even supports USB recording. And it costs just £120. The bargain price may inspire misgivings (we still can’t shake off the memory of the poorly executed Crosley Cruiser), but the L-85 surprises us. 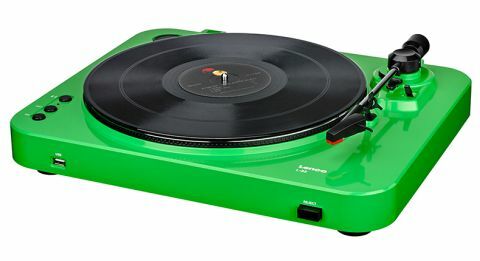 Lenco has tried to make the turntable experience as easy as possible, and this is by far the best plug-and-play machine we’ve come across at this budget price. At first glance it looks and feels like a toy. It’s made predominantly of plastic, and is very light. Once we take a closer look, however, we don’t have any complaints with the actual build quality. The plinth, platter and tonearm are all nicely made, they all fit together neatly, and once we start using it, there aren’t any wobbly or creaky parts – it’s an encouraging start. The plastic buttons for changing the speed (33.3 and 45rpm), and to record are responsive. Our review sample is a vivid green, but there are five other finishes: red, yellow, black, white and grey. The analogue outputs are also tucked away at the back, right next to the power switch. Lenco helpfully includes a pair of RCA cables in the box, so you can get started straight away. Thanks to the built-in phono stage, you can plug the L-85 into your stereo amplifier, or directly into active desktop models such as the Ruark MR1s (£299). The L-85 also comes with a removable plastic dust cover that sits back neatly on its hinges. Our one small gripe is that there’s no LED telling you when the turntable is switched on. The Lenco L-85 is designed to be as user-friendly as possible – and it succeeds. Everything comes pre-fitted, including the moving-magnet cartridge, and there’s no need to set the counterweight, adjust the bias, or weigh anything. The only adjustment you have to make is to reset the auto-return motion. Move the arm right to the end of the record and let go: it will calibrate itself and return to its armrest in one smooth motion. If you want to stop the record playing in the middle of a song, you don’t have to physically move the arm yourself either. Just press that big ‘Reject’ button on the front and the arm will automatically rise up and return. Neat! Lenco has another little trick up its sleeve: converting your vinyl into MP3 files so you can listen to your music when you’re on the move. It’s all done via USB as well, and couldn’t be simpler. There’s no need for special audio software or tricky laptop hook-ups – just plug a memory stick into the front panel’s USB port, hit the record button when you’re ready, and voila – you have an MP3 version of your vinyl record that you can play on your laptop or copy onto your smartphone. You can also separate the tracks by pressing the split button. It will only record as MP3 files, but remember this is a £120 turntable – it would be unrealistic to expect hi-res FLAC files from it. If you like the recording feature but want higher-quality files, we’ll have to point you to the excellent Sony PS-HX500 (£450). Time to find out how the Lenco L-85 actually sounds, and we tentatively put on Alice in Chains’ MTV Unplugged recording. It’s good; in fact, it’s a surprisingly decent performance. Voices are the deck’s strongest point, with Layne Staley’s strained and piercing singing on Down In A Hole coming through clearly - you can really glean the emotion he puts across in the song. The sharp twang of the acoustic guitar cuts through the hazier rhythm of the rhythm guitar and drums in the background, which gives us a better sense of the song’s structure. We’ll admit: it’s not the most detailed or articulate performance, nor does the rhythm charge along with pin-point precision and agility, but we weren’t expecting such a likeable, inoffensive sound that’s this easy to listen to. Play Michael Jackson’s Beat It, and the drum hits are too gentle and the bass is woolly, but the balance across the frequencies is admirably even and there are no coarse edges at the top end. Play those USB-recorded files on your computer, and you’ll find the sound character is exactly the same as the Lenco’s vinyl performance. Listening to the L-85 is equivalent to listening to MP3 or Spotify streams on your smartphone using £50 headphones. You know you can achieve much better sound quality, but this method gets the essential structure of the songs right. The Lenco L-85 is very much a “My First Turntable” – a great starting point for you or your kids to get into vinyl, or if you’re a student and want something decent yet affordable to play your records on. Unless we bring to mind decks that cost well over £200, we can’t think of another turntable that combines its features and user-friendliness with such a likeable performance. If you’re thinking of getting into vinyl, this is a decent place to start.